Last week, I detailed how I built a custom Metadata editor that shows me only the fields I can use for Flickr. However, that’s not the only thing I’ll be using FotoStation for. While FotoStation is not able to talk directly to Flickr’s API, it is able to call on other applications, and so, by installing the Flickr Uploadr and creating a simple action that sends the images to Flickr Uploadr, we have a semi-automated upload process. We could make this a simple Launch application action, which just launches Flickr Uploadr and loads the images there, or we could create one or more checks of fields, such as Keywords (Tags), Object Names (Title) or Caption (Description). We can even allow or bypassing required fields, depending on how rigid we want to be. The above screen capture shows three actions, two that looks alike (Check required text fields), and a simple Launch Application action. The Check required text fields actions check different fields (the first one just checks Keywords, while the second checks both Object Name and Caption), and only the second one has the option “Allow to bypass when a required text field is missing” enabled. The order of operations matter here, anything I want FotoStation to do, needs to be listed before the Launch Application action. Likewise, any modifications to the file, such as cropping, resizing, Sharpening and Watermarking should be followed by a File Format or Save File action before the Launch Application action. If not, the changes will not be saved. 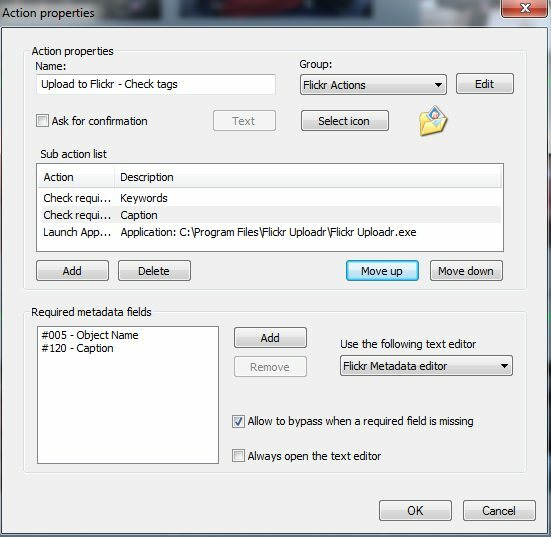 The reason why we don’t need to do that for the Check required text fields action, is that, when triggered, it opens the metadata editor, where you can make and save the changes before the image is sent to the Launch Application action.